Solar street lighting is an investment in the future. Solar street lighting saves money. Choosing renewable resources and emerging technologies helps extend the life of your community’s infrastructure. Today, the gap between infrastructure replacement required and work being completed is growing: electrical needs in the United States will total $177 billion by 2025, according to the American Society of Civil Engineers. 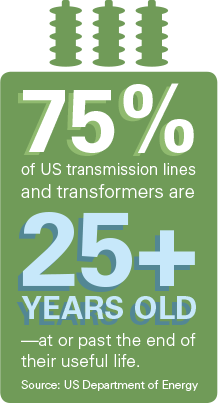 Today, about 75% of US transmission lines and transformers are 25-plus years old—at or past the end of their useful life. Investing in renewable technology now still requires an up-front cost, but you’ll reap the rewards with a low-maintenance solution. The longer you wait for infrastructure replacement, the more your current maintenance bill grows. Avoiding all underground wiring in future projects can immediately provide maintenance relief. You won’t have to repair transformers or trench: solar outdoor lighting has no below-ground infrastructure to worry about and offers a fixed cost with a 10-year warranty, saving you money while also helping reduce the strain on the grid. Solar commercial infrastructure lighting is becoming an increasingly desirable asset when combined with smart city monitoring. It can have a positive environmental impact and help future proof your city. Now that’s an investment to feel good about. See the savings in action. The issue: Thieves stole 370,000 feet of copper wiring over a four-month period, disabling about 700 street lights. Copper wiring sells for $2–3 a pound as scrap, and at 10 feet per pound, this amount of wire could be worth between $74,000 and $111,000. The cost: The Los Angeles Public Works Department spent close to $1 million repairing many of the damaged lights, with more lights flagged for repair. City crews attempted to secure the wiring boxes or weld them shut, but thieves still broke into some boxes multiple times. The result: Funding earmarked for other city services had to be reallocated for these repairs, making those services suffer due to lack of funding. Citizens reported concerns of increased theft and danger of accidents. Where Sol fit in: One of the hardest hit areas was a three-mile stretch of the LA River Bike Path. The City of Los Angeles chose Sol to provide 100 solar-powered pathway lights, which don’t have underground electrical lines and therefore don’t require copper wire. Batteries and other components of these self-contained lights are stored at the top of the pole, helping reduce the likelihood of vandalism. Invest now. Upgrade your street lights. Any community can make upgrades: change is not restricted to the biggest cities with the biggest budgets. All communities can utilize new approaches, materials, and technologies to ensure infrastructure is more sustainable and resilient to change. Modernize your infrastructure by comparing lighting technologies and the shifting trends in your community. You may also find new applications where solar lighting systems can help illuminate areas that may have been prohibitively expensive or impossible to access before. Learn how we’ve added lighting where traditionally lighting couldn’t reach.